Will the Real Madame Please Sit Up? When Wayland Flowers died in 1988, he left ownership of his creation—campy, raunchy puppet Madame—to Marlena Shell…or Mark Paquette. It all depends on whom you ask. For 22 years the novelty act Flowers made famous on shows like Solid Gold, The Hollywood Squares, and the short-lived sitcom Madame’s Place has attracted audiences, starring in HIV benefits and sharing stages with Carol Channing and Bea Arthur. But two Madame puppets have been making the rounds—one voiced by Paquette (Flowers’s ex-boyfriend) and another by performers hired by Shell (Flowers’s longtime friend). 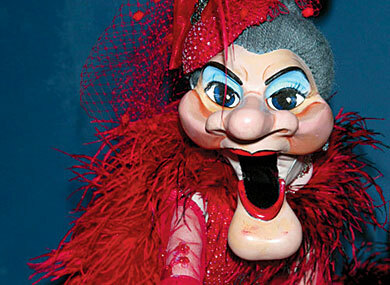 But now a U.S. district court has been asked to decide the identity of the real Madame; Paquette filed a $10 million trademark infringement suit against Shell in August, claiming she has no claim to the foulmouthed puppet. Even with the suit progressing—as of press time, Shell had yet to be officially served—both parties say they’re moving forward with Madame appearances. Paquette says he has charity gigs lined up and is working on a new TV series. Shell says Skye and Madame will continue to perform at casinos and clubs, mainly from bookings that come through MadameAndMe.com.